Travelling outside of your comfort zone with multiple food allergies can be daunting for anyone involved in food preparation. From coming up with snack and meal ideas free of all allergens, to preparing food that is not contaminated with allergens. Between my two boys we have eight different foods to avoid every snack time, every meal time, every day. Given the complexity of communicating this to restaurants and the stress involved with cross-contamination in a busy kitchen, I feel more comfortable if we take our own food for the boys food everywhere we go. If I haven't made it, my boys don't eat it. I prepare all meals and bake all snacks before we leave and freeze everything. It's time consuming leading up to the holiday, but well worth it when we arrive. I can enjoy our holiday knowing that my boys will be eating safe (and healthy!) food from my own kitchen. Gosh, there is nothing worse than staring at your child as they eat, waiting for swelling, welts or breathing difficulties to appear - or not - is there? I definitely don't need that stress on holiday. I have a great little zip-up esky on wheels and fill it with all my cooking, baking and cold packs before wheeling it into the airport and checking it in with our luggage. So far the longest it's taken us to reach a freezer at our holiday destination is 7 hours in the height of Australian Summer - and I'm very pleased to share that everything is still rock solid frozen when we arrive. We always board the airplane last so that we don't feel rushed to wipe the seats and tray tables down with passengers queuing up behind us. My husband will wipe everything down with baby wipes while I stand with the boys in the aisle. We can then settle in and enjoy the flight without being over cautious about contact reactions. At our holiday destination, we stay in self contained apartments so that I have access to a kitchen. This way I can pull food out of the freezer and heat it up at meal times. This means I don't have to head back from the pool and hour before everyone else to prepare dinner! If my husband and I feel like eating out at a restaurant we simply take the boy's meals with us. The boys still love the experience of going to a restaurant even though they don't order from the menu. They enjoy a special drink and some colouring in and we get to feel semi-normal! Equipped with plenty of baby wipes we wipe the table surface down when we arrive and the boys eat their meals with us. We have not had a problem with bringing our own food to restaurants, they seem very accommodating when they understand the boys have food allergies. Spot the allergy parents - baby wipes and wiping everyone down on arrival...that's us! 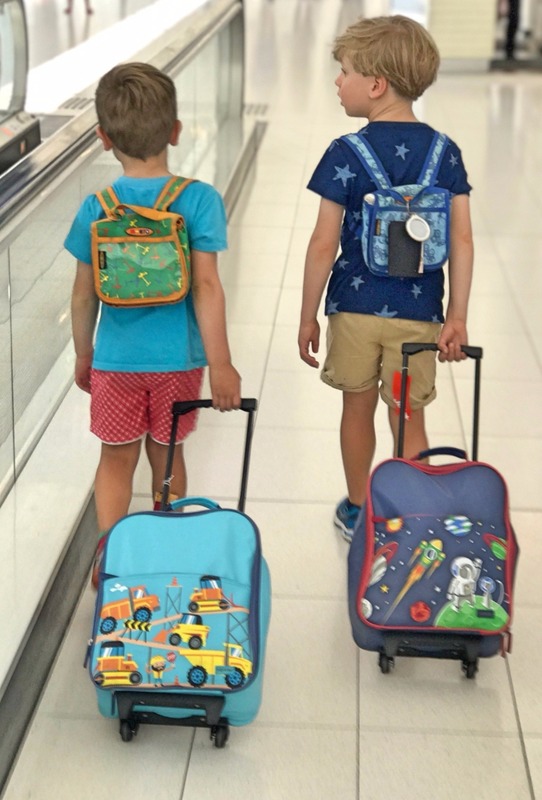 My boys always carry their own epipens in a little back pack and I always keep two spare epipens on me whilst travelling, or back at the holiday apartment on arrival just in case we loose a backpack along the way. As allergy carers we can never completely turn-off, let our guard down and relax; however this little system helps me enjoy a family holiday.